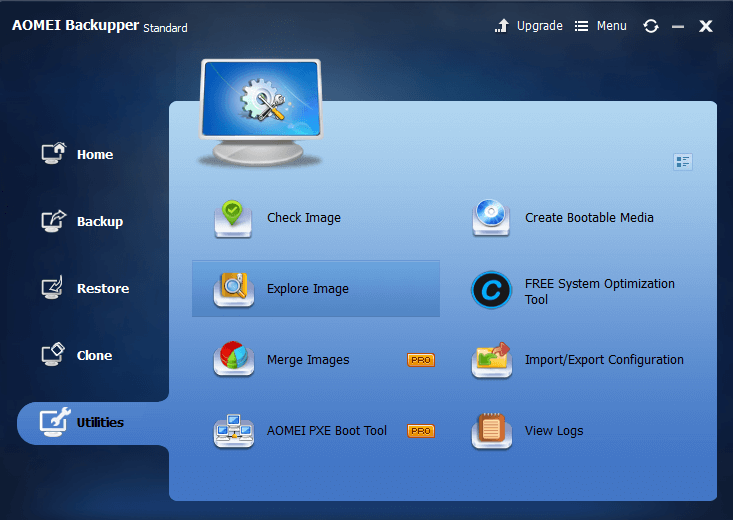 Meet The Cool Windows Backup Maker! 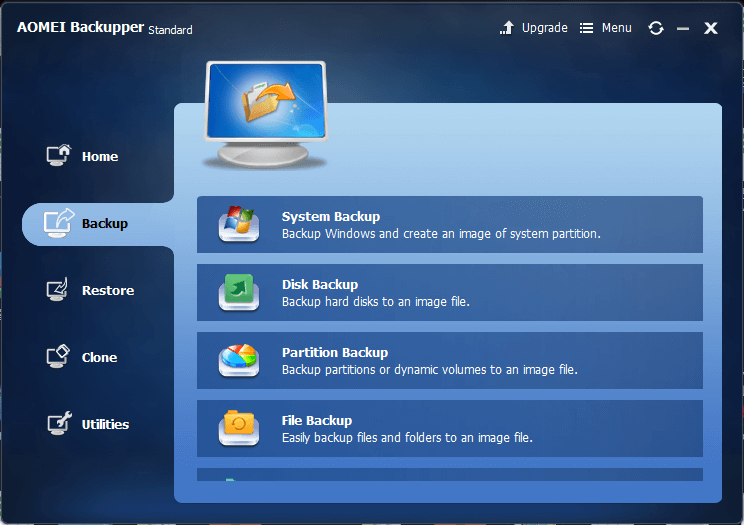 If you want to find a backup software to take the place of Windows built-in backup program. The first step maybe google as windows backup software. If you want to look for a freeware, you can change to windows backup freeware while searching on Google. Then you will get lots of suggestions and answers too. No matter what results comes out but the software with moniker AOMEI Backupper might be there too the freeware in Standard Edition. If you enter official website via above result, the central area of the screen is information about the latest version of AOMEI Backupper – 4.1! Wait, a button reads Upgrade to Pro. Because the software standard is a free software while it also has paid editions. For common people, try free edition first is a wise choice. Download the freeware, install and run, we can see the software interface which is very cool! Deep blue and clear. This Windows Backup Software is a full scale System management which can backup Windows OS and system settings and won’t interrupt your work. File Backup can backup individual files or folders in local hard disk or NAS. Disk Backup can backup many kinds of hard disk drives, such as internal disk, external disk, USB flash drive and other storage devices that can be recognized by Windows. Partition/Volume Backup enables to backup one or more specified partitions or dynamic volumes. File Sync helps you synchronize and back up files to the other place simply, some functions are very useful such as event-triggers and real-time sync. This Software is also a clone tool. Disk Clone function makes it clone a hard disk to another without creating an image file and you can resize partitions during the process. 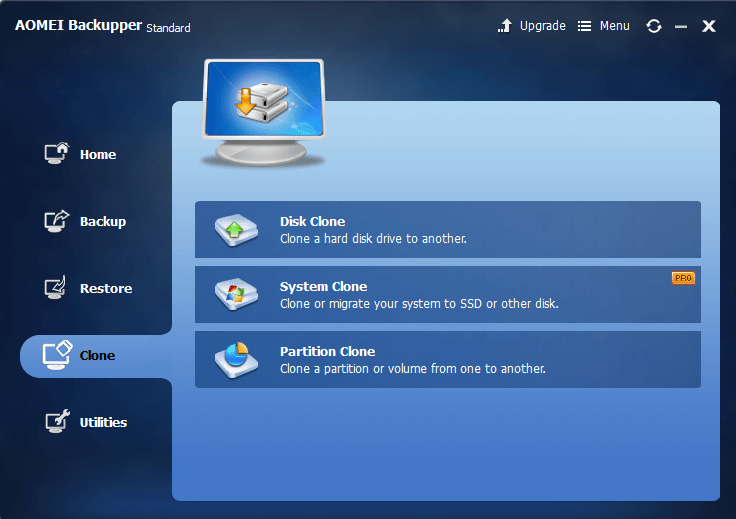 Partition Clone function is similar. About System Clone, the newest version of AOMEI Backupper is paid to use, there are old versions only need to unlock it to experience. This features is to move Windows 10 to new hard drive and don’t need to re-install Windows. Besides backup and clone, the restore functions of this software is also very strong. 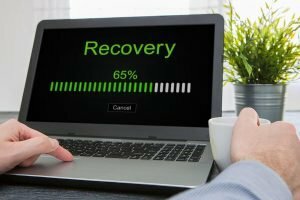 It supports Selective Files Restore, Dissimilar Hardware Restore, Restore System from Bootable Disc, Restore from Command Prompt and Restore with Partition Alignment. When you buy a new computer without pre-install operating system. The first thing you should do is installing OS and creating partitions, split partition. When you optimizing partitions later, you wish not need to re-install system. So, how to do it? For common users, you should try partition software. Usually, Windows has no built-in partition tool, the disk management has some limitations. So you’d better to find a third-party partition program. This software Assistant is a professional one, and it has free editions – as Standard Edition for PC and Lite Edition for Server. Main functions of this backup Assistant are resize partition, move partition, merge partitions, copy partition, migrate OS to SSD/HDD, convert between GPT and MBR, convert dynamic to basic, convert between FAT and NTFS, convert between Primary and Logical. Even the free edition also provides an amazing function named Windows To Go Creator, which will help you to create a portable Windows 8 in your USB flash drive so that you do not need to buy Windows 8 Enterprise Edition any more. Standard Edition and Professional Edition supports up to the latest Windows 10, Server Edition and other advanced editions not only support Windows PC operating systems, but also support Windows Server operating systems. AOMEI Partition Assistant supports the more advanced 4K partition and other high technology. In a word, Partition Assistant is a great partition magic software. Above is a screenshot of Partition Assistant Standard Edition, you see, its main interface is simple. All partitions in your hard drive are displayed on the interface. Options are on the left Wizards and Disk Operations panels. Right click specified partition or disk you can also find some options. Among them, Migrate OS to SSD is a very useful function when come to hardware upgrade. SSD Secure Erase is AOMEI’s unique feature, there are no other similar partition software in the market has such function. It is simple to start, every step has instructions. It is also safe, you are able to preview changes before apply or commit the task. How to choose the right edition? There are 6 editions. 2 freeware, 4 paid. If you are Windows PC user, you can try Standard Edition first, then decide whether to buy the Professional Edition or other advanced editions later. However, If you are Windows Server user, you can try Lite Edition first, then decide whether to buy Server Edition or other advanced editions later. Have a partition manager in your computer always good. AOMEI Partition Assistant supports multiple languages: English, French, German, Chinese, Japanese, Spanish, Italian, Hungarian, Polish, Russian, Dutch, Turkish, Catalan, Vietnam, Portuguese. People all over the world can handle it easily.